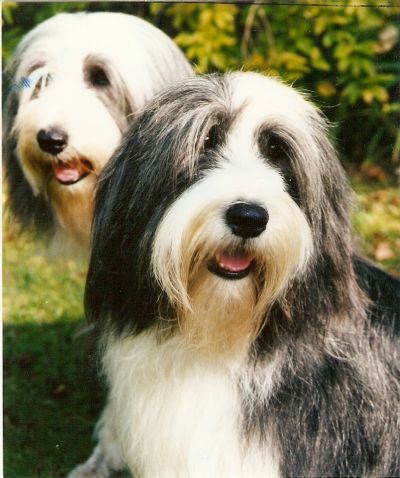 As the show Beardie moved further away from my type it became increasingly difficult to find stud dogs of other lines that I could use without bringing in unwanted 'modern' traits. 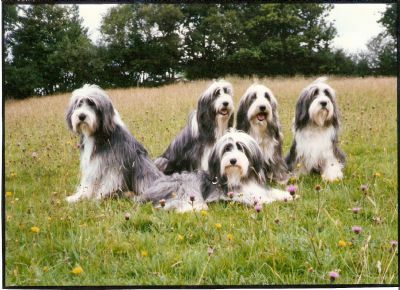 In retrospect I can see that this would have been a good time to turn to the Working Beardies but I was not yet quite ready to turn my back on the KC completely so I used the most suitable KC dogs I could find and put the resulting progeny back to dogs of my own line to maintain type. But since all KC reg Beardies were (and still are) descended from the same handful of foundation stock, the gene pool was dangerously small in either case. 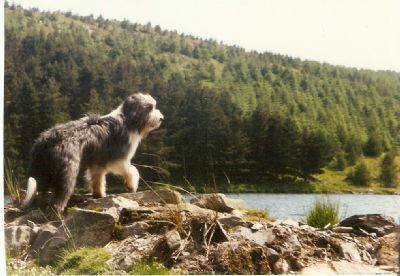 Banner was typical of the closely linebred Brambledales and was my favourite of the three Branwen daughters that I kept. 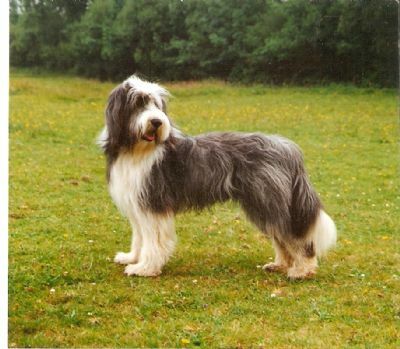 Tall and athletic, with an ideal coat, she was not only extremely intelligent but also extraordinarily caring. 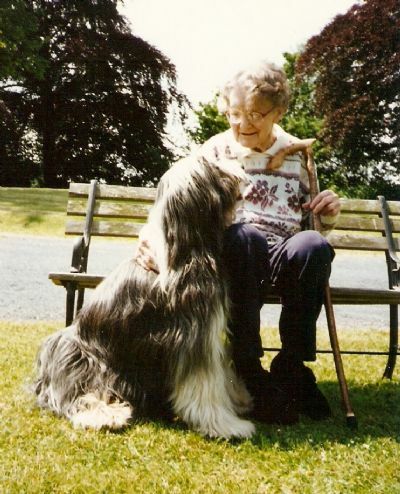 From an early age she made herself responsible for any puppies in the family and then devoted herslf to looking after my mother in her later years. 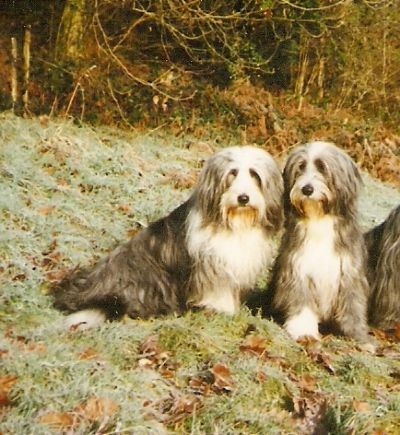 After my mother's death in 2000, Banner cared for her own mother, Branwen, until she died and then spent the rest of her life acting as nanny to puppies well into her sixteenth year. 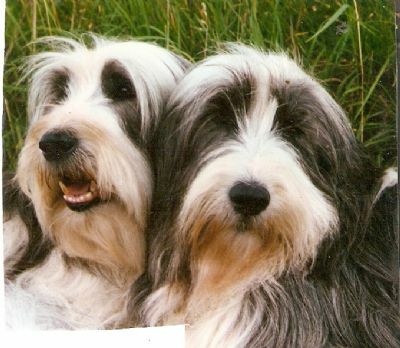 Banner with her mother, Branwen. Branwen is flanked by her three resident daughters : Banner (sired by Branwen's own sire, B.Balzac), Bright Star (by Willowmead Touch a Star) and Braint (by Ch Sammara Standing Ovation). Brighde is daughter of Bright Star and Ch S. Standing Ovation. 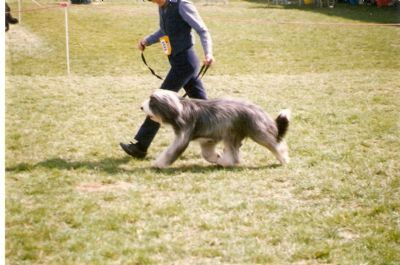 Above: One of our last appearances in the showring.....Brambledale Braint at the Welsh KC Championship Show in 1996. Brambledale Banner (on right) with her daughter B.Batista, born 1996, by Ch. Brenriga's Double Take . Known as Lovely (because she was) Batista had a delightful character and broke our hearts by dying before her second birthday from a condition diagnosed as kidney failure but later suspected to have been auto-immune disease. 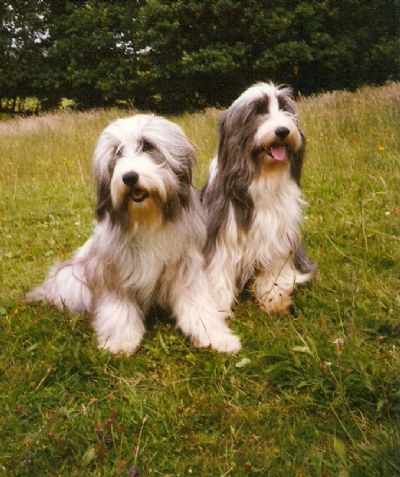 The loss of Lovely in 1998 left us without a successor to Banner and it was her niece, Brighde, who had to carry the line into the next decade and a change of direction.